Shepherd’s Bush probably derives its name from some prominent shrub on the trian­gular green where shepherds used to rest their flocks on their way to market in London. However, this can’t be confirmed and there may instead have been a connection with a person named Shepherd. In 1657 Miles Syndercombe hired a cottage that stood on the site of the present Bush Hotel and planned to use a primitive form of machine-gun to assas­sinate Oliver Cromwell on his way to Hampton Court, but was betrayed by his accom­plices. Shepherd’s Bush remained entirely rural until the late 18th century, when ribbons of housing appeared along the main roads, followed by terraces to the north. By 1830 semi-detached houses were going up on the west side of the green but fields lay to the south for several more decades. Stations have opened and closed at Shepherd’s Bush since 1844 but the first really useful halt was built on the Hammersmith & City Railway in 1864. Shepherd’s Bush was almost wholly built up by the time the Central Railway’s ‘tuppenny tube’ reached here in 1900. 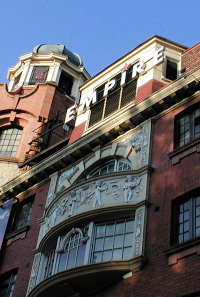 Now a rock music venue, the Empire Theatre opened in 1903 and was nicknamed the ‘Coliseum of west London’. Lime Grove film studios followed in 1910. Both were subsequently taken over by the BBC and used as television studios. By the 1930s much of Shepherd’s Bush had become very run down and the council cleared slums and built flats during the third quarter of the 20th century. South-east of the green, an ugly car park and shopping precinct replaced old shops. The Bush Theatre opened in the upstairs dining hall of the Bush Hotel in 1972. The arrival of the vast Westfield shopping centre in 2008 signi­fic­antly changed the character of the northern part of Shepherd’s Bush where it overlaps with White City. Large parts of the area remain socially disad­vantaged but Shepherd’s Bush has become popular with young graduates. “It’s all happening in Shepherd’s Bush. We’re the new bush-geoisie!” says Gerald the Suffocator in Candace Bushnell’s novel Four Blondes. No. 24 Oil Drum Lane, Shepherd’s Bush West, was the home of Steptoe and Son in the television comedy series of that name.